THIS SITE IS DEDICATED TO ALL THE GRAPHIC ARTISTS, ACCOUNT EXECUTIVES, ENGINEERS, PROGRAMMERS, SALES REPS, BOOKKEEPERS, MANAGERS, AND OTHER EMPLOYEES WHO WORKED AT THE ORIGINAL, GENERAL ELECTRIC-CREATED GENIGRAPHICS CORPORATION (1973-1994) WHOSE EFFORTS HELPED FORGE A NEW INDUSTRY . The GE-GENIGRAPHICS 100B INTERACTIVE WORKSTATION, 1981. Operated by DeAnna Foran at the Genigraphics Service Center in Oakbrook, IL. Photo courtesy of DeAnna Foran, 2009. Copyright the Genigraphics Art Society, 2011. Not to be reproduced without permission. 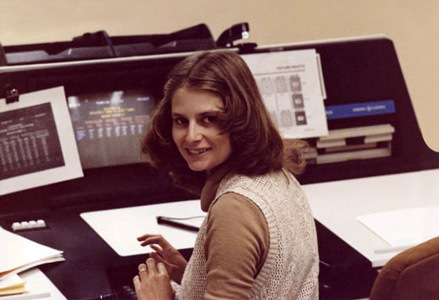 The GE-Genigraphics Art Society was created for the enjoyment and appreciation of all former employees of the original Genigraphics Corporation as well as former employees of the many companies that utilized Genigraphics equipment – and anyone with an interest in the early years of the computer graphics industry. Former employees are encouraged to join to connect with others and document their experiences from this first generation of computer graphics workers. Share your passion for computer graphics and commemorate the company that helped start the graphics technology and computer revolution. This educational, non-commercial website and organization are not affiliated in any way with the current Genigraphics LLC company, In Focus Systems, General Electric, Microsoft Corporation or the original Genigraphics Corporation. The website and alumni organization's purpose is to preserve, educate, document and celebrate the achievements of the original Genigraphics Corporation, the early, influential computer graphics company in business from 1973 to 1994. All original artwork and images on this website copyright The GE-Genigraphics Art Society, 2013 unless otherwise noted. Cannot be reproduced without permission. All rights reserved. Vintage symbols and drawings from the original Genigraphics Reference Guide as displayed on Genigraphics.org are Adobe Illustrator conversions, and are copyright The Genigraphics Art Society, 2013, unless otherwise noted. The images cannot be reproduced without permission. All rights reserved. Original source artwork was created by the GE-founded Genigraphics Corporation. This website and the G.A.S. was started by Abby Weissman in 2008. He was a Genigraphics artist/designer from 1981 to 1992 who is still actively involved in presentation graphics.To contact the GAS email info@ge-genigraphics.org or abbyw@abbyw.com. To learn more about Genigraphics click here.